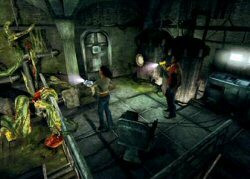 Survival Horror comes to the XBox in force in the way of Obscure. The first impression that players will get is inevitably the comparison to a certain vampire slayer by the name of Buffy. Keep playing however as apart from the general look of Buffy, this game holds it's own in spades and then some. Kids are disappearing from the local high school and as is always the case, the authorities and parents for some reason are not shown nor seem to care. The only ones that do are a group of friends that are prepared to go where no one else will, into a world where nightmares are real and failure will result in death. There are some really neat ties to this story, one of which is the chance that players have to go through this title cooperatively with a two player mode or by taking along a team mate with you controlled by the computer AI. There are a few teething problems initially as you get used to the way that the AI operates and how to get out of it's way as when using melee weapons you can get clonked on the head by an enthusiastic partner with a baseball bat if you are not careful. Once you've both got guns it's all good though. Obscure combines light puzzle work with combat and the monsters that you have to take on are pretty nasty beasties that are surrounded by an inky black cloud. Make sure you are carrying a torch or light source of some kind as they can be defeated or weakened by illuminating the creature which will get rid of this creepy defensive shield. A neat move that I discovered earlier in the game is that if it is light outside the room you are in, smash some windows to really take care of the monsters. Whilst this game isn't terribly hard, it's going to provide everyone who plays it with a challenge as there will be many times that you find yourself really low on health and trying desperately to find energy drinks to boost your health up. Health is scattered throughout the game as are CDs that you use to save your progress. Don't go crazy saving your game as once that CD is gone you have to find more to do it again. They are certainly there to be found but you might find as I did that you have to play for some time after a big battle to find another to save that all important progress. 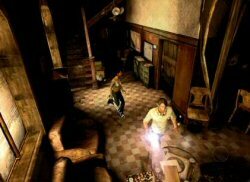 You can combine items in this game as you can in other survival horror games so make sure that you fasten your flashlight to your gun whenever you can. It makes getting rid of the inky cloud surrounding the creatures so much easier. You can "boost" the light from the torch by pressing and holding your left shoulder trigger but be sure not to overheat it as you can wreck your precious light source and be left in the dark with the horrors that await. Something you really, really do not want to do. Let me give you the hot tip! Graphically this title is very pleasing although I did wish that you had a little more camera control, the game presents like others in the genre, with the title firmly controlling what you see when you are moving about in order to up the ante in frights and jump worthy moments, which you are sure to. Environments are a treat to make your way through with polygonal areas to traverse as opposed to your prerendered backgrounds. Window shutters open and slam shut, lockers can be banged into and cage doors creak back and forth. Add to that an extremely ambient soundtrack and you are in for a gaming treat. Character development is done through the cutscenes where you'll learn more about the five kids that you can play as, as well as learn about their individual abilities. When playing single player you can control the secondary character through the D Pad and they can assist you with a single button press. Some of the characters know whether there is anything of interest in a room, whereas others intuitively know whether or not the room is worth visiting. It's a neat way of making sure that you do pick up everything you are meant to, though I did find at times I'd be using it more as a crutch during the game, just let the AI tell you where the good stuff was and you'd be set. In summary ObsCure is a good and entertaining game that will keep you in front of the tele for quite a few hours. 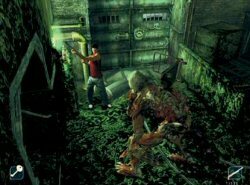 It's drawback is the crutch it provides with the AI, the obvious allusions to a Buffy type environment and simply the fact that it doesnt quite reach the horrific factor that Silent Hill does. That said, you will get many jumps out of the game as things rapidly change and charge you with bursts of fright. I enjoyed the title and do recommend it as one that you could really get stuck into. Give it a shot and let me know what you thought.